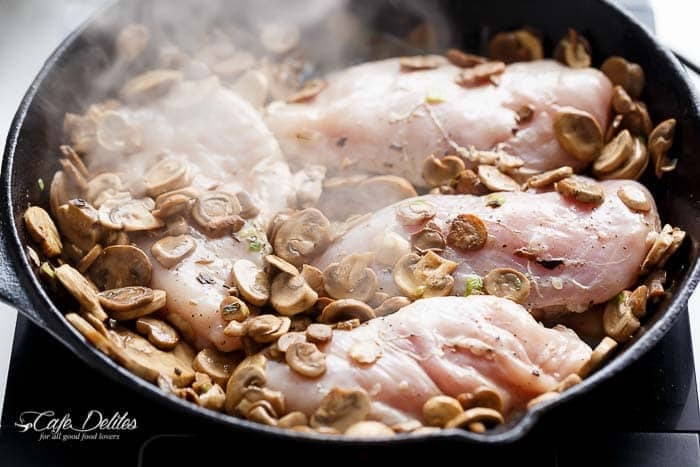 Julia Child’s Creamy Chicken & Mushroom (Supremes De Volaille Aux Champignons) lightened up! 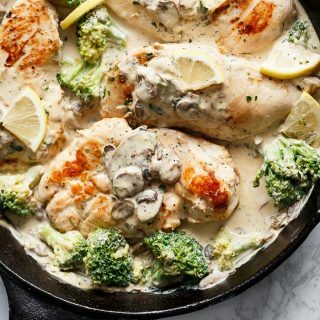 It takes less than 30 minutes to have this gourmet meal at your table — in one skillet — without any guilt. Keep it low carb and serve this over Zoodles or Cauliflower Rice OR carb load it with pasta and normal rice! The choice is yours. Beyond excited that I’d left out chicken breast early in the morning, I began exploring said recipe all over Google. Turns out, it’s easier to find than I thought since Julia Child is somewhat of an icon. Immediately browsing her recipe, I knew you would want this chicken just as much as I did, with half of the calories. In comes my version. The recipe does include Julia’s original ingredients and method, plus my substitutions and the addition of broccoli! It was important to me to keep all of Julia’s flavours. I never mess with a good thing when it’s already GOOD. 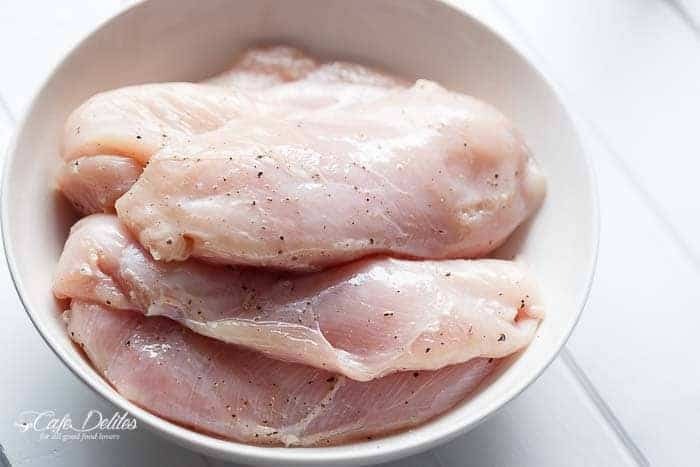 Start off by rubbing your chicken breasts with lemon juice and seasoning. Melt butter until frothy. Add your shallots (green onions), sautéing for a couple of minutes before browning. Yes, Julia. (I swear, it was like she was watching me, arms crossed and head held high.) Then add mushrooms and sauté lightly for a minute or two without browning. 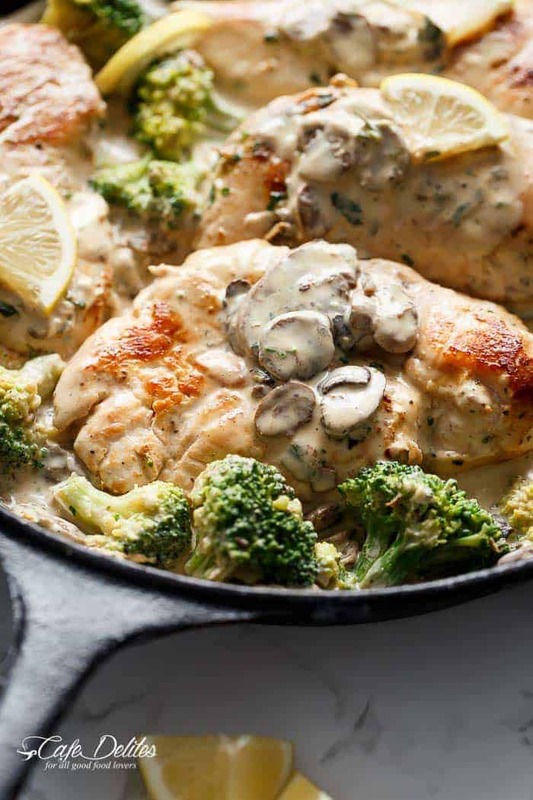 Remove chicken once they’re cooked and continue with your sauce… Julia Child’s recipe calls for 1 cup of whipping cream. As much as I love cream, I decided to sub that out and replace it with 1/2 cup cream cheese (reduced fat) and 1/2 cup evaporated milk to keep the calorie count low. However, you can use full fat ingredients OR follow Julia Child’s recipe (in the recipe box below). I added steamed broccoli florets into the skillet to get some vegetables onto my children’s plates. And dinner was served. My favourite quote from the movie? “Well, what do you really like to do?” asks her husband, Paul. Julia responds, “Eat!” “And you do it so well.” Ahhhh Julia. I feel you. It may be lightened up BUT it’s still thick and creamy! With all of the one pot recipes I have on here, THIS is one of my favourites! In the words of Julia: Bon Apetit! 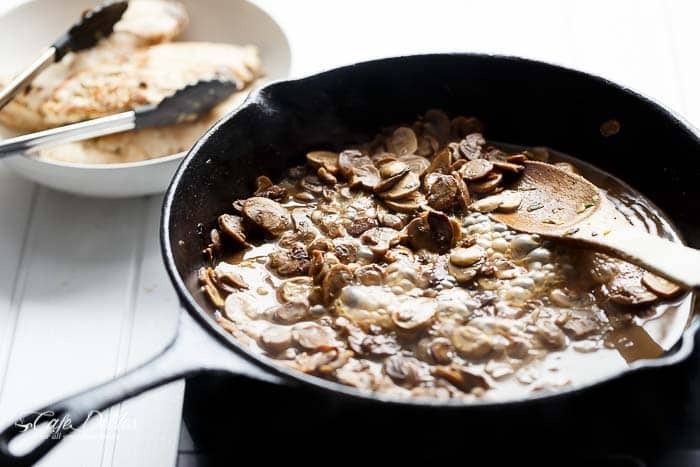 Julia Child's Creamy Chicken + Mushroom (also known as Supremes De Volaille Aux Champignons) lightened up and cooked in one skillet! A gourmet meal ready in less than 30 minutes! Preheat oven to 400°F (200°C). Rub the chicken breasts with lemon juice and season lightly with salt and pepper. Heat the butter in a heavy, oven-proof casserole (I used a skillet), about 10 inches in diameter until it is foaming. Stir in the minced shallots or green onion and saute a moment without browning. Then stir in the mushrooms and sauté lightly for a minute or two without browning. Season with salt. Quickly roll the chicken in the butter mixture and lay a piece of buttered wax paper over them. Cover casserole (skillet) and place in hot oven. After 8-10 minutes, flip chicken and cook for another 8 minutes in the oven. 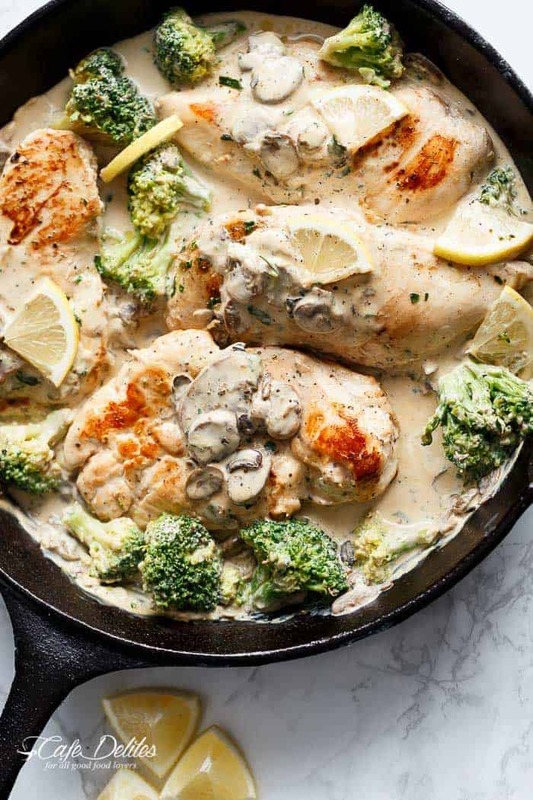 Alternatively, brown chicken fillets on each side until golden; then cover and place into a preheated oven to continue cooking for a further 8 minutes until cooked through. Remove the chicken to a warm platter (leave mushrooms in the pot) and cover while making the sauce. 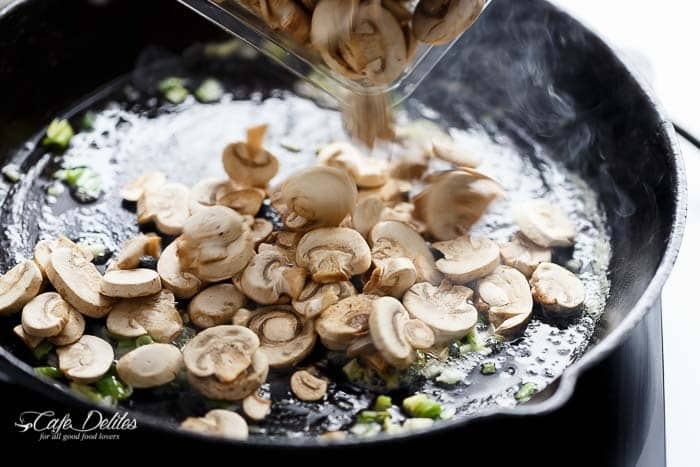 To make sauce: Pour the stock and wine in the skillet with the mushrooms. Boil down quickly over high heat until liquid has reduced to half. Add in the cream cheese, breaking it down with your wooden spoon. Cook over low heat until it turns into a thick cream. Gradually add in the evaporated milk, stirring through the cream cheese until thickened. Take off heat and taste for seasoning. Squeeze over a little extra lemon juice to taste. Add in the broccoli (if including it) and pour the sauce over the chicken. Garnish with parsley and serve immediately. Original recipe by Julia Child's Mastering the Art of French Cooking, Volume 1. Lightened up version by Karina, Cafe Delites. This recipe was wonderful. My husband is a very fussy eater, but loved this one! I used Laughing Cow creamed Swiss cheese as I did not have cream cheese in fridge. use 3 pieces = 2.25 oz and worked fine. Also used 1/2 & 1/2 as that I what I had. Severed with steamed broccoli over egg noodles (for hubby). Next time will do noodles for me. Wow, looks wonderful, I will be making this tonight. Using chicken thighs instead of breast. Thank you very much for this recipe. I dont like using reduced fat anything. I only cook with full-fat. I like adding the chicken broth with the full fat cream cheese. This is the recipe I taught my 11 year old daughter to make. It is always wonderful. First, thanks for the movie trailer! I loved that movie and found myself smiling through the trailer! Secondly, the chicken was delicious with the substitutions of light cream cheese and almond milk. I have made this recipe before (after watching the movie) with heavy cream. Well, too many delicious, rich dinners and I am now lightening up my recipes! The broccoli was a nice addition! Hi Sherri! Aw you’re very welcome! I’m SO happy you liked this version! I’m actually buying the DVD now. Absolutely in love with it! That’s so wonderful to hear Christina! Thank you so much for coming back to let me know 🙂 It’s fine to reheat. The sauce does solidify, but it will become a thinner consistency once reheated. If not, add a couple tablespoons of milk at a time while reheating and stirring, until reaching a desired consistency 🙂 I hope this helps! YES! Margaret I bet you have a few containers in your refrigerator, like me (for a ‘just in case’ type of situation) 😉 We are kindred spirits! Heather I couldn’t agree more! Stretchy pants be gone 😉 Lol!